The Winona Lake, Ind., Grace Brethren Church (Bruce Barlow, lead pastor) is the site of The Winona School of Professional Photography this week, as the school is hosting a “Returning to our Roots” experience. Meeting at the Hub, the community center which is owned by the church, the school is conducting courses in lighting, retouching, digital portraits, available light photography, and more. In addition to classes, there will be an all-school portrait taken, a sunset shoot on Winona Lake, a field trip, a trade show, and more. The Hub is located on the site of the original School of Photography and includes the auditorium which was built by the school in 1956. 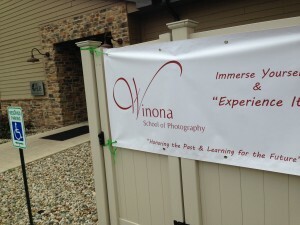 The School of Photography, which originated in 1912 as the Indiana School of Photography met every summer in Winona Lake until the school moved to Mount Prospect, Illinois, in 1984. The school owned three buildings–the Daguerre Building (built in 1904 and razed in 2008), The Hub, and the Winona Dairy on Kings Highway, which was used as darkrooms and now houses the Grace College and Seminary physical plant offices.